Maybe there is a place that doesn’t have any real names—a place where wolves stalk fat baby seals on pristine beaches and eagles perch on twisted pines to pick the bones; a place where humpback and orca whales are common; a place where schools of wild coho rampage through massive bait balls. That somewhere is located amidst a chain of small islands in northern British Columbia, just south of the Alaska border. Flyfish Journal Editor Steve Duda and Photo Editor Copi Vojta travelled to this area, known as the Gnarled Islands, and returned with a portrait of a place outside of time and far away from the world. The Gnarled Islands remain a mystery—primordial, raw, hidden. They are difficult to find on a map and even with GPS coordinates, they appear as tiny, pixilated blobs floating off the northeast coast of Dundas Island, itself a good 25-minute floatplane trip from Prince Rupert, British Columbia. The area is isolated, pristine and untouched—and with that comes a stubborn refusal to reveal any part of itself—its history, its habits, its secrets. The Gnarled Islands have been this way for forever. 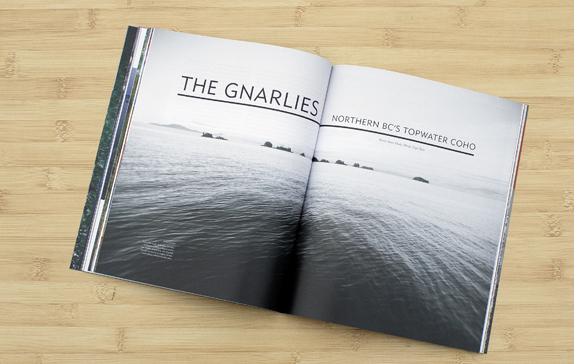 Subscribe to start your collection of the world’s best flyfishing publication.